You can't see it as I did, the night of the 1978 summer solstice, which was also the night of a full moon. I spent that night alone on Medicine Mountain, Wyoming, at the Bighorn Medicine Wheel. After many unexpected experiences during the night, I saw the expected solstice sunrise line up with an old tree branch I'd placed with tobacco, sage and cedar in the central cairn. Usually I have no voice and am no kind of singer, but then I faced that rising sun, then suddenly stood up and sang a song loud and joyful in a language that I think no one knows any more. (But I knew what it meant while I was singing.) I never sang like that before, never since. You can't do that (and I can't again), because the U.S. Forest Service has developed it now as a tourist attraction. There are now 30,000 visitors during the short summer period it can be visited. Interpretive presentations are now given under Forest Service sponsorship by people from nearby Crow and Cheyenne tribes. It was white men (discovering it at the end of the 19th century) who named it "Medicine Wheel," terminology they applied to anything Indian observed or told them they didn't understand. White men of the Sheridan Chamber of Commerce -- particularly as tourism in the Bighorn National Forest got underway as economically significant to the town -- made a huge mystery of it, and ignored the fact that there are at least 40 other wheels on the high plains (mostly in Canada), as well as some sites far removed, both spatially and culturally. One of these (Cahokia in Ohio) has been called "An American Woodhenge" because of similar astronomical sightings from a large circle of postholes, all that remains. The "-henge" and the interest of astronomers in solar, lunar and star sighting relationships, comes from a 1960's analysis of the famous Stonehenge in England. In the late 1960's British astronomer G.S. Hawkins showed with astronomical computations that the ancient circle of huge megaliths was a solar-lunar and stellar analog computer made by pre-historic Celtic tribespeople. This gave Eddy, then an astronomer (whose speciality was the sun) at the High Altitude Observatory at the National Center for Atmospheric Research, near Boulder, Colorado, the idea to make an exact survey of the Bighorn wheel, and observations and computations following the methods used by Hawkins. To see if the rocks, the mountain, sun, stars and the spatial directions could tell us something people have long forgotten. He found that they could, that nature itself speaks to those who know how to interpret, via astronomy, geometry, and mathematics. Generally, the methods used -- at least until the excitement this discovery occasioned -- are not known to anthros. --Here -- on a Wyoming tourist map -- is where the Bighorn wheel is, west of Sheridan, on Alt 14-A, which used to be a poor 1-lane bulldozed into an old travois trail. You used to have to hike about a mile to get to the Wheel, It's on a high, bare shoulder, at about 10,000 feet, above the tree line, with almost a full horizon view all around. There's a precipice not far behind the main sun-sighting altar dropping to the Bighorn River valley. A steep bluff with some sharp drop-offs slopes down to a lower ledge on part of the shoulder that's still above the tree-line and overlooks the broad valley to the southeast. --This color photo of the Bighorn Wheel, was supplied by the U.S. Forest Service Bighorn district office is taken (probably in the late 1970's) looking due east (there is a red east marker at the edge of the windswept bare shoulder's stepped drop-off). Snow is still visible on the distant ridges and forest below, but has been blown clear of the shoulder here. The wheel is about 90 feet in diameter, though it's not a perfect circle. The central cairn (solar backsight) is about 12 feet in diameter. It was about 4 feet tall when I visited it in 1978. The sunrise sighting cairn is at the lower right from this photo angle, separated from the wheel's rim by a 12 foot spoke extension. It is U-shaped, longer than wide, and open at the end toward the circle's center. You can stand or sit in this cairn -- I slept in it, lying stretched out in my sleeping bag, then I sat up -- to sight the solstice rising sun along the spoke and through an old dead branch I placed in the central cairn. Behind you will be a steep precipice, down to the Bighorn River valley, across which there are visible snowy summits of high peaks that bound Yellowstone National Park, 100 miles away. On the front lower left of the wheel is the starsight cairn. Across the rim, on its eastern side, are the cairns used as backsights for sighting the dawn-rising stars Aldebaran, Rigel, and Sirius, as calculated and discovered by astronomer John Eddy in 1972-4. At the right is a cairn that lines up with dawn-rising of the southern bright star Fomalhaut, as discovered by Jack A. Robinson, in 1980. The ancient geology of Medicine Mountain has formed a very special place, perhaps unique in all the world. Regardless of when the Wheel was built up there, there is every likelihood it has always been sacred to Native peoples, because its special character, an acient sacredness long predating the existence of humankind and even animals, can be felt. That's probably why the Wheel was built there, actually. Tourist desecrations might have been worse, probably would have been, except for years of determined protective efforts by the Medicine Wheel Alliance, an organization that got its start through the Northern Cheyenne Cultural Commission. In 1988, the Forest Service made a developmental proposal for the wheel, which was protested by people from Northern Cheyenne, Crow, Arapaho, Sioux, and Blackfeet tribes, who later formed the protective organization. Anthros seem mainly to have asked the Crow about the wheel (their reservation in Montana is nearest, and there is a small, damaged wheel near Fort Smith on their present rez land), Northern Cheyenne may know more about it. The Wheel figures in an unsuccessful treaty-based land claim filed by the Northern Cheyenne in 1929, just inside (its shoulder precipice forming part of) the boundary of land including the Bighorns and Powder River country they maintained the U.S. took illegally). After my night alone up there seeing the solstice sun rise right on the ancient altar's lineup I went to the home of a traditional woman elder friend at the nearby Northern Cheyenne rez. No one there could tell me much about it, then, except that "It was up there that the instructions were given for the first Sun Dance." The Wheel itself was said to be those instructions. Sundance lodge, with entrance to east and 28 rafters for the 28 lunar cycle days. This, according to Lakota elder Black Elk, was the original form of the Sundance lodge, which he says was Cheyenne, though nowadays lodges may be made with fewer rafters. The diagram from above is similar to the basic shape and orientation of the Bighorn Medicine Wheel, which has 28 lunar day spokes from its central cairn. According to Forgot name??? 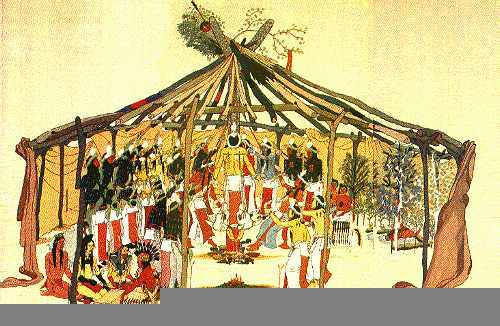 it's similar to a Cheyenne Sundance lodge created for a masama ceremony. In 1988, the Forest service wanted to put a parking lot and latrines right next to the Wheel, with some kind of interpretive center building, and a big platform overlooking the Wheel itself. They were going to pave the rough road up there to improve access, and take that road all the way to the site. (I had to hike in. That was part of it.) In May, 1991, the Forest Service issued an Environmental Impact statement. The Alliance responded "There is no consideration of the Native American in this document; it is designed for tourists." There was no plan to restrict tourist access during ceremonies, although the Forest Service said they'd ask the public to voluntarily stay away at solstice or equinox ceremonies. MWA coordinator Nicol Price said that in the summer of 1991 such voluntary restraint was shown to be quite futile, when curious tourists even snapped photos as Indian elders tried to conduct ceremonies, Tall Bull, who was one of the leaders in the many-year negotiations of the Alliance said "The federal government has no respect for our shrine, or the Indian people who regularly worship there." Some compromises have been made -- the parking lot was built a mile or so away, they have to go that last mile on a foot trail -- all 30 or 40 thousand of them. Indians lead the interpretive presentations. Major structures the Forest Service wanted weren't built (the latrines are at the parking lot). I'm glad of these things, but quite sorry to hear of the many tourists who come, gawp, then go away. I am very glad I followed whatever it was thatled me up there to that then-deserted place 20 years ago. I would not have wanted to "attend a ceremony" up there that was being conducted by any peoples at all. Though I'd read a scientific article about its use as a solar and astronomical "analog computer" and written about this and other medicine wheels of the high northern plans for Akwesasne Notes in 1974, I didn't know much about it when I drove 1,000 miles for that solstice, not even where it was, really. --To start with, the Bighorn Wheel is not unique. These stone structures -- observatory cairns or altars of stone, circles, with some spokes -- seem to be located only on the front range high plains area of the Rocky Mountains, and most of them are in Canada, Alberta and Saskatchewan. The map shows some 28 of them that are still in fairly good shape today. None are as high as the one on usually-inaccessible Medicine Mountain, but all are on the highest point (usually in an area of rolling hills), with a full observational horizon. On the map I've marked Medicine Mountain's wheel in red, and another I'll discuss briefly, Moose Mountain, in blue. That one (or maybe one even older) seems to be the original or prototype of the star knowledge that went into building the Bighorn wheel's star sighting cairns 1200 years or more later. 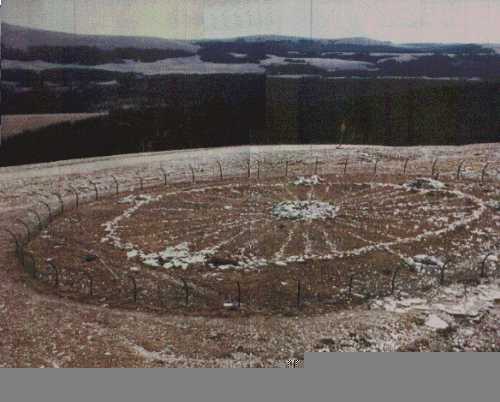 At Fort Smith, on the Crow reservation, is a small wheel , whose longest, southwesterly spoke and central altar-cairn form a sight on the summer solstice rising sun. West of Great Falls, Montana is a wheel whose southerly spokes are partly destroyed by erosion from the Sun River, but suggests a similar alignment. At the top of the Continental Divide, near an old travois trail, on Trail Ridge Road in Colorado is a huge, rough cairn with two long spokes that line up with summer solstice sunrise. Not shown on the map, in Minnesota, on the open grassland prairie of Blue Mounds state park there is a 1500-foot line of quartzite boulders which is a northeasterly sighting line for solstice sunrise, though the Historical Society mistakenly identifies it as equinoctial (which would be direct east-west; many non-scientific people are confused about the words equinox and solstice). Not far from it (not in the park) are the enigmatic Jeffers Petroglyphs -- thousands of mysterious signs pecked into flat red rocks which may include astronomical records. 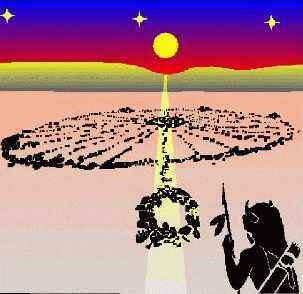 CREDITS:I redrew (from the 1980 cover of the Bulletin of Archaeoastronomy and colored an artistic version of the wheel seen from just in front of the sunsight altar just as the solstice sun has risen although the 3 speical stars are not visible then, I placed them in the sky roughly where they could be sighted from the starsight cairn. The black and white drawing of an eagle spirit, Pipe, mountain, crescent moon and dipper stars was drawn in Indian ink in 1978 by Tissonie, Johnny Creed Coe (Cherokee) who was art instructor at Red School House AIM Survival School that fall. He gave it to me one evening when we were both trapped there by a big blizzard, I told him it seemed emblematic of the experience I'd had on Medicine Mountain that summer. The buffalo skull centering the Bighorn Wheel is the logo of the Medicine Wheel Alliance, which continues to work with tribal people to save sacred places from desecration. Prints of the black and white photos of the Medicine Wheel were given to me by a U.S. forest service secretary at the Bighorn National Forest office in Lovell, Wyoming, on the day of the solstice, 1978, when I visited that office before going up on the wheel for the night. It was apparently taken by Roger M. Williams of the Forest Service from a low-flying plane, around 1972. I have re-oriented it so the directional alignment is correct. The side view of the Wheel was also a black and whtie print th Forest Service gave me in 1978. It was taken by an anthropologist in 1926, some time before the Forest Service put up a high steel fence around the wheel, but after they had built a low stone wall around it. The color photo of the wheel was recently sent me by the Bighorn office of the forest Service, but seems to have been taken some years ago, perhaps in the late '70's or early '80's; photographer and date were not identified. The diagram of a Sun Dance lodge, and the explanation of it, are from The Sacred Pipe: Black Elk's Account of the Seven Rites of the Oglala Sioux, as told by Black Elk to Joseph Brown, University of Oklahoma Press, 1953. Richard West, well known Northern Cheyenne artist, likes to explore artistically themes of traditional knowledge. This painting, "Cheyenne Sundance, First Painting of the Third Day" is from the Philbrook Museum of Art, Tulsa, OK. CREDITS: Page logo (also used for icons) was originally a cover of the Winter, 1980, Archaeastronomy Bulletin, a photocopy of which was attached to some articles from it the Dr. John Eddy sent me in 1993. The artist isn't credited on the cover, and other Bulletins are not available. I scanned it, tracd it in FreeHand, made some rearrangments for btter design, and colord the picture, which was used as a cover on a unit about the Bighorn Meedicin Wheel for Heart of the Earth Indian students in 1993-94. It was rasterized for use on this web page. The black and white drawing was given to me by the Cherokee artist Tissonie (Johnny Creed Coe) in 1979, when I told him it reminded me of my experience there, and told him a bit of what had happened. Though its framed now, I was able to photocopy, scan, then do a lot of touch-up correction for this web page. The color photo of th wheel, taken from a nearby bluff, was furnished by the U.S. Forest Service, Loveland (Bighorn National Forest) office. The Sundance lodge drawings are from Joseph Epes Brown Seven Rites of the Oglala Sioux, as used in Dr. Eddy's original article about the Wheel in Sciwnce, 1974. Richard West's painting of a Cheyenne Sundance lodge was scanned (and cropped slightly to remove areas which could not be properlys canned because of curvature) from (the Turner book based on the 1993 video show). The ad for the Medicine Wheel Alliance was scanned, traced in Freehand, and colorized by me from some literature for the Alliance (to which I at one time belonged). The map locating many Medicin Whels, mostly in Albrta, Canada, was scanned from an article by Dr. Eddy; I added labels and color coding.